It’s that time of year when we all want to lose a bit of weight and get healthy…..
Well here’s an idea for you. I can’t help with your diet and I can’t make you go out and exercise but I can help you to quit smoking. Take up crochet!! Your mind will be full of stitches and creativity that you will have no time to think of cigarettes. I myself was a smoker so I know all about the cravings and difficulties that come with giving up. I also know how important it is to have a distraction and I think crochet is a perfect one. It is easy to learn, quick and totally addictive. So replace one addiction with another that is a far healthier and cheaper. Be BOLD, be BRAVE and be CONFIDENT. Before you know where you are the cigarettes will be a thing of the past (unless you make one of these http://dearbitsyetsy.tumblr.com/post/24153868428/crocheted-cigarettes-and-lighter) and you will be surrounded by beautiful things all made by YOU! Evelyn modelling another Grandma’s Attic creation. A very simple crochet poncho using a multi coloured acrylic yarn by Paton’s with a matching beret. 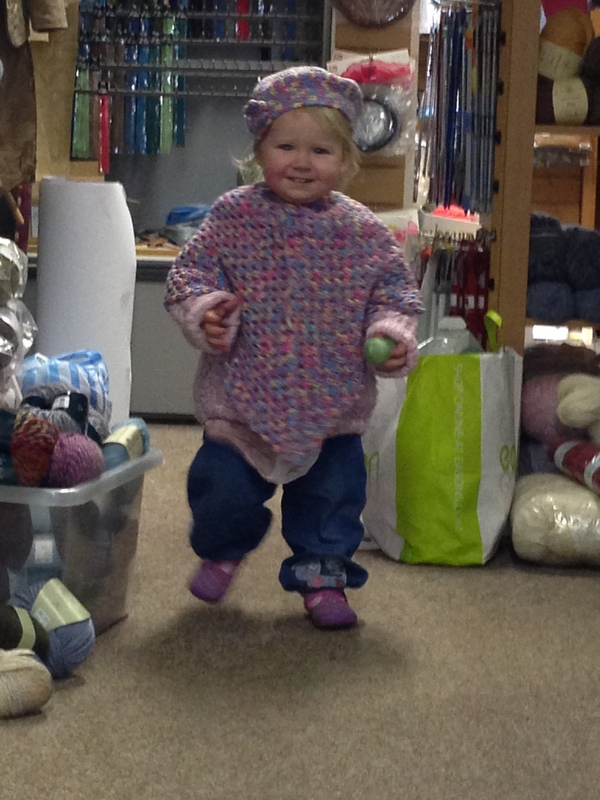 This is a very easy garment for beginners to try and looks very effective with the coloured yarn. Can be made to fit any size. Grandma’s Attic charity knitters have now knitted over a whopping 360 cushions for the Belfast Royal Cardiac Ward. I think they deserve a massive pat on the back. As a thank you I recently arranged for a local herbalist (also a knitter and spinner) to come along and show them how to make herbal creams. Great fun was had and they all made themselves a pot of cream including a healing cream, a nourishing cream and a cream to banish wrinkles!!! We had herbal tea and all knitting needles were banished for the afternoon! 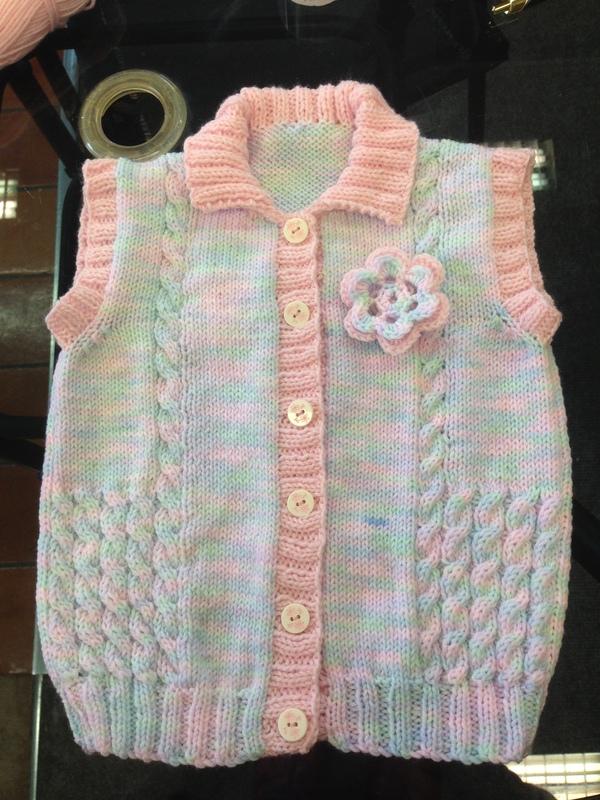 This is a little Gilet that was made by me for my granddaughter, Evelyn. I didn’t have enough wool to do the borders but think it worked ok. Don’t be afraid to experiment with colours and different yarns. It is good to be individual and it is good for stash busting. Here is the latest creation from Grandma’s Attic. 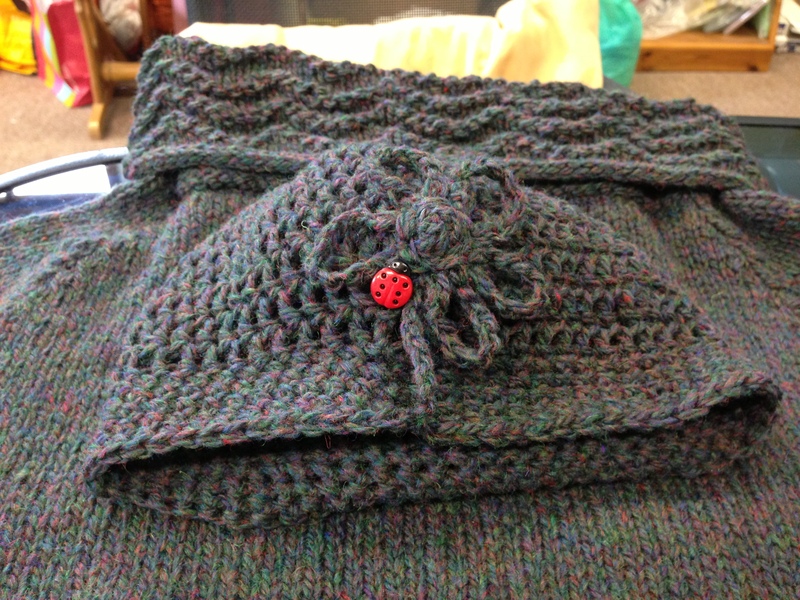 The jumper was a customer request and the hat was using up the last of the yarn. It is a 100% wool and will be just perfect for the cold Irish winters!